WARNING: This device deals with high voltages. It is very unwise to build it unless you fully undestand it and are aware of the risks. I take no responsibility for whateever you may inflict upon yourself and/or others directly or indirectly. The power supply is a cheap solution for experiments with tubes, nixies and anything that needs high voltages (50-500V) at a very small current. The advantage of this PSU is that it is isolated from the mains. The basic idea is that you have two transformers, each with one primary and two secondary winding. The output voltage is controlled via switches. Among starters it is a little known (or maybe known, but ignored) fact, that you can use the transofmer both ways: to transform for instance 230V AC to 6V AC, but also to transform 6V AC to 230V AC. Note, that the voltage MUST be AC (I know it may sound silly repeating basic facts, but a friend of mine once used DC for this and then called me why isn’t it working and why is the transormer getting all hot.). Basically the idea of the device is that you first transform the input voltage from the mains downwars to 2x6V or 2x12V. Then you transform it back into higher voltage. When you apply 6V to a 12V secondary on a transformer you get half the voltage you’d get if you’d applied 12V. 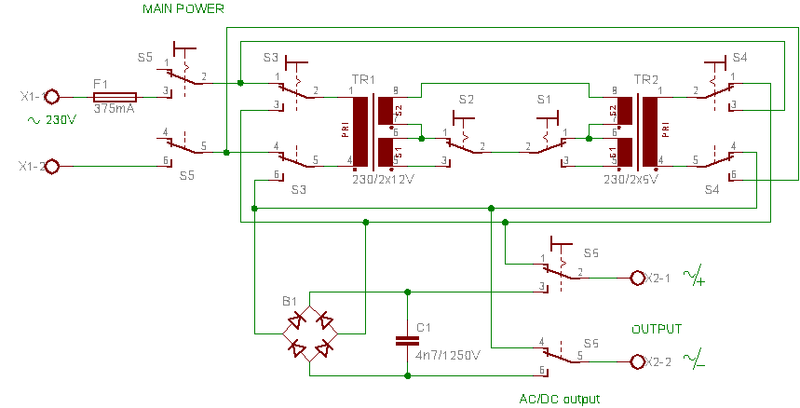 If you apply 24V on a 6V input you get 4 times the normal output voltage. And if you apply 12V on 12V you get the normal voltage. Switching is done through S1, S2, S3 and S4. I used small wattage transformers for the design. They are already hermetically sealed and very safe against heating etc. With S5 you set whether the output should be AC or DC. S6 is the mains switch. WARNING: S4 and S3 must never be switched both oppositly at the same time. In one case the tranformers start heating up (short circuit), in the other they are both disconnected. In the Ideal case you will use a fourpole switch and merge S3 and S4 into it. This entry was posted in Other, Projects and tagged high voltage, nixie, tube, vintage. Bookmark the permalink.